WHAT IS A WOLF DOG HYBRID? The term, "hybrid" 1 can mean a lot of things, but here I am talking about the offspring that is a mix between two different species/subspecies of canine animals that are close enough genetically to reproduce. A Wolf Dog is the animal resulting from the breeding of a wild animal with a domesticated animal. Since the change in the scientific nomenclature in 1993, 2 there have been arguments that a dog is a wolf and conversely that a wolf is a dog. They have common ancestry, but behaviorally and physically they do differ; even their nutritional needs vary. Wolves are wild animals that evolved from nature's strategy of "Survival of the Fittest." This means that the cleverest, strongest and healthiest animals survive to pass on their genes. These wild creatures are wary of humans and can be jumpy when in unfamiliar territory or strange situations. In contrast, over the past fifteen thousand years we molded the wild canine into the domestic dog. Through selective breeding we have chosen traits to form a companion animal that is amiable to our wishes, cooperative with humans and physically diverse. During that same time, wolves have developed fast reflexes and incredible jaw strength. This comes in handy during hunting. Speed helps to avoid injury and allows a low ranking animal to quickly steal tidbits from the kill. Jaw strength enables the wolf to rip through the hide and to shatter the bones of the prey for the precious marrow. Wolves serve to balance the environment and to cull out the sick and weak prey animals. They live in tight family groups called packs. Each has their role with a complex hierarchical system. Complex communication and communal care is contrasted with squabbles within the ranks and fights to rise in the hierarchy. Dogs, on the other hand, have been molded to stay in a cooperative and dependent state. They are adapted to accept human leadership and it is not essential for them to challenge that leadership or to change it. As our companions, dogs are adapted to living in our homes and families without having to mark or fight for territory or status. They accept our leadership and we are comfortable with them. This is different from the wolf who is territorial and who will vie for leadership upon maturity. Most pet owners cannot identify the signals their own dogs give. Often a wagging tail is interpreted as a good sign, however that is not always the case. A wagging tail can signal tension, aggression, fear, or conflict. Understanding this is supposed to be easy to do however most people misinterpret the signals. In contrast, body language is more subtle and complex in the wolf. A glance and posture change could signal a warning. When it escalates into vocal and physical chastisement of another wolf or human it can seem very intense to a casual human observer. Most people wouldn't even recognize the etiquette violations that trigger it. Greeting behavior in wolves can be intense too. When composed, the greeting ceremony may include licking, leaning, rubbing, and whining. Howling, biting, body slamming and other activities can be observed in the more exuberant moments. Dogs will greet their humans with exuberant tail wagging and licking. Unschooled animals may also greet by jumping, whining, barking, running, whining and other activities. Many will argue that there is always a potential of risk 3 with any animal. This is true. However, domesticated animals have been bred to obtain their cooperative behavior with man; hybrids and wild animals have not. Although all domestic dogs are related to the wolf, man selectively bred the undesirable traits out over thousands of years to obtain a good companion animal. Breeding hybrids mixes conflicting traits between the wild and domestic animal. Most people cannot provide the higher caliber pet ownership care and management that a Wolf Dog hybrid needs. This is what leads to trouble. The wolf is an amazing animal. It is the public's imagination that puts the wolf into one of the top slots for intrigue and attention. Some see strength, grace, loyalty, and beauty in the wolf while others feel hatred, disdain, or fear towards the wolf. Either way, this powerful predator calls out to us. We answer this call in our folklore, in allocating mystical powers to the wolf, and in imagining them to be something they are not. 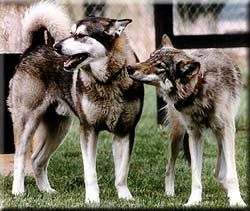 It is the wanting to connect with them in some way that leads people into wanting to own a Wolf Dog hybrid. In general, most people are looking for an animal that looks like a wolf but acts like a dog.